Governor Martin O’Malley and Peter Greenleaf, chairman of the Maryland Venture Fund Authority, today announced that $84 million has been raised for Maryland’s Innovation Economy through InvestMaryland – an historic initiative created by the Governor and passed by the General Assembly last year to invest in the State’s promising start-up and early stage companies. 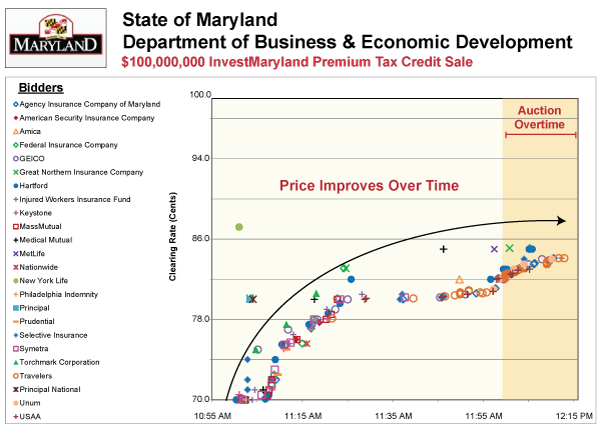 The $84 million raised far exceeds a goal of $70 million and was generated through an online auction of premium tax credits to insurance companies with operations in Maryland. While other states have sold tax credits to fund similar venture capital initiatives, Maryland is the first state to use an online auction to raise the capital for such a program. The inaugural round of investments will be made in innovative companies this summer through several private venture capital firms and the State’s successful Maryland Venture Fund (MVF). InvestMaryland is the largest venture capital investment in history by the State. The program is being implemented through the Venture Fund Authority and the Maryland Department of Business and Economic Development (DBED). Today’s online auction attracted more than two dozen insurance companies with operations in Maryland, who bid on the tax credits with a floor of $.70 on the dollar. The 11 companies awarded the credits are Agency Insurance, Chubb, GEICO, Hartford Insurance, IWIF, Med Mutual, Met Life, NY York Life, Selective and Traveler’s. Insurance companies can claim tax credits beginning in 2015. Key tenets of InvestMaryland, Governor O’Malley’s signature economic development proposal last year, have been implemented over the past nine months. In August, the Governor named the Venture Fund Authority, a nine-member panel that oversees the administration and operation of the program. Earlier this year, the Authority selected Grant Street Group to prepare for and run the tax credit auction and also recently selected Altius Associates, a London-based firm, to oversee the selection of three to four private venture firms to invest the InvestMaryland funds. The private venture firms will be responsible for investing two-thirds of the funds, which will return 100 percent of the principal and 80 percent of the profits to the State’s general fund. The remaining 33 percent will be invested by 17-year-old Maryland Venture Fund (MVF). Over its life, the MVF has invested $25 million into hundreds of start-up and early stage technology and life sciences companies, generating a $61 million return, 2,000 jobs and more than $1 billion in private investment. The Maryland Small Business Development Financing Authority (MSBDFA) will also receive a portion of funds for investment. Returns on the funds invested through the MVF will be reinvested in the program. Among its benefits, InvestMaryland has the potential to create thousands of jobs in Innovation Economy sectors – life sciences and biotechnology, cyber security/IT and clean/green tech and attract billions of follow on capital. It mirrors many aspects of a federal program to accelerate high-growth entrepreneurship nationwide, The Startup America Partnership, which President Barack Obama launched year. The program is one of a number of initiatives Governor O’Malley has introduced to spur innovation and entrepreneurship in Maryland. Earlier this year, the Governor announced a legislative proposal to create the Maryland Innovation Initiative, an historic partnership between the State and its research universities to advance cutting-edge research to the commercial marketplace. Maryland has an outstanding infrastructure to support an Innovation Economy. The Milken Institute ranks Maryland #2 in the nation for technology and science assets. According to study results, while Maryland received high rankings in human capital investment, research and development inputs, technology and science workforce, and technology concentration and dynamism, it lagged behind other states in risk capital and entrepreneurial infrastructure, demonstrating the need for InvestMaryland and other programs. The Index provides measurements of the technology and science assets for states, ranking them on their ability to foster and sustain a technology sector, which research has shown is a crucial factor in determining a region’s future economic success.